Abstract: The southern Bouse Formation (late Miocene-early Pliocene) contains a controversial record of either marine, marine-estuarine, or lacustrine conditions in Blythe basin just prior to the ancestral Colorado River reaching the Gulf of California. Ostracode assemblages (microscopic crustaceans) and stable oxygen (d18O) and stable carbon (d13C) values in fine grained sediment (micrite) and ostracode valves from the lacustrine northern Bouse Formation and contested southern Bouse Formation were studied to determine depositional environments. Faunal and stable isotopic analogs from well-studied marine basins, marine-to-lacustrine transitions, estuaries, and over-spilling terminal lakes will be briefly discussed and applied to the southern Bouse Formation controversy. The expected fill-and-spill lacustrine origin for the northern Bouse Formation is observed as a rapid shift from a saline tolerant Cyprideis-Limnocythere ostracode assemblage with coincident high d18O and d13C values in paired ostracode valve and micrite samples to a fresher water Candona-Darwinula ostracode assemblage with coincident low d18O and d13C values in paired ostracode calcite and micrite samples. An identical and coincident shift from more saline tolerant to fresher water ostracode species and from high to low stable isotope values occurs in the southern Bouse Formation, suggesting a similar fill-and-spill lacustrine environment. The d18O and d13C values in Candona valves from the northern and southern Bouse Formations are nearly identical, suggesting similar environments. Two exposures of southern Bouse Formation sediments, located at the northern and southern margin of Blythe basin and separated by nearly 100 km along what might have been a “Bouse estuary”, contain the freshwater ostracode Candona and contain ostracode valves and micrite with nearly identical d18O and d13C values. This similarity in freshwater continental ostracode species and stable isotope values at both ends of a potential “Bouse estuary” is incompatible with a marine or an estuarine interpretation. The Candona-bearing ostracode faunas and d18O and d13C values of the lacustrine northern and contested southern Bouse Formations are surprisingly similar, suggesting the southern Bouse Formation sediments featured in this talk are lacustrine in origin. Bio: Jordon Bright was born and raised in Ottawa, Ontario, Canada. He received his BS in Geology from Utah State University in 1996. At Utah State University, he began working as a student employee in Dr. Darrell Kaufman’s Amino Acid Geochronology Lab. In 1998, Jordon followed Dr. Kaufman to Northern Arizona University, Flagstaff. He returned to school in 2000 and received his Master’s degree in Quaternary Sciences from N.A.U. in 2003, mentored by Dr. Kaufman and the late Rick Forester (U.S.G.S., Denver). His Master’s thesis focused on a 120-m-long core recovered from Bear Lake, Utah & Idaho. He used ostracode faunas and stable isotopes to create a 240,000-year-long paleoclimatic and paleohydrologic record for the Bear Lake watershed. He remained at N.A.U. after receiving is Master’s degree, managing Dr. Kaufman’s lab, and working with several U.S.G.S scientists and academics who were unravelling the integration history of the Mojave River, and later, the Amargosa River of southern California. He returned to school in 2011 at the University of Arizona to pursue a Ph.D. in Geosciences under Dr. Andy Cohen. 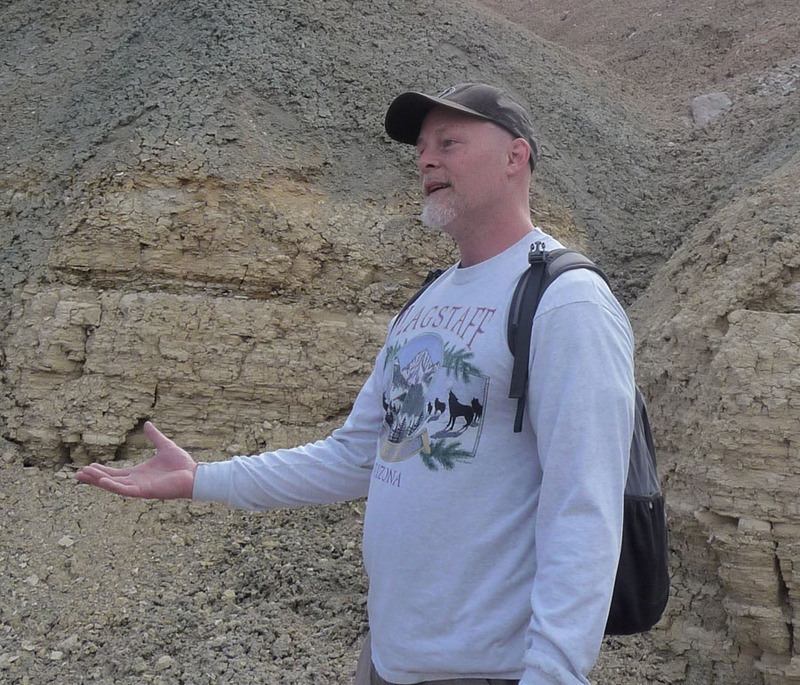 While at the University of Arizona, he has been involved with paleohydrology studies at Willcox Playa, here in Arizona, at the Snowmastodon ProjectTM, through the Denver Museum of Nature and Science, and at the Térapa fossil vertebrate site in Sonora, Mexico. His dissertation focuses on two topics: the micropaleontology and stable isotope record from a 166-m-long core recovered by the Smithsonian Institution from the Olorgesailie Hominin Site in Kenya; and the topic of this talk - what the micropaleontology and stable isotope record from the enigmatic Bouse Formation, here in southwestern Arizona and southeastern California, can tell us about the development and integration of the late Miocene-early Pliocene lower Colorado River.